So I have always wanted to try lemon meringue pie. When I was a kid there were these lemon meringue pie flavoured pudding cups. They didn’t have any dairy or eggs so I could eat them and they were delicious. Probably full of food colouring and chemicals but delicious. Thus began my obsession with the idea of eating a lemon meringue pie. 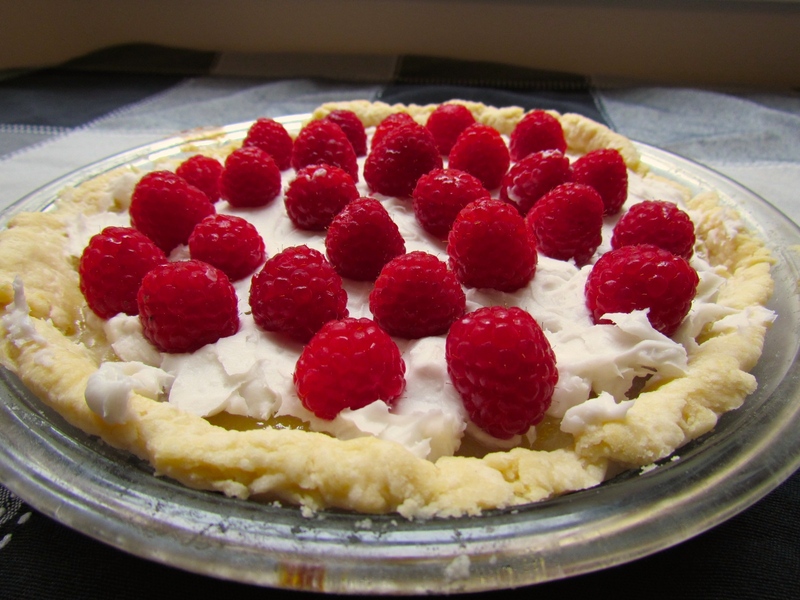 I finally made what I think is as close as I’m going to get and I added fresh raspberries because raspberries definitely make everything better. This pie is everything. 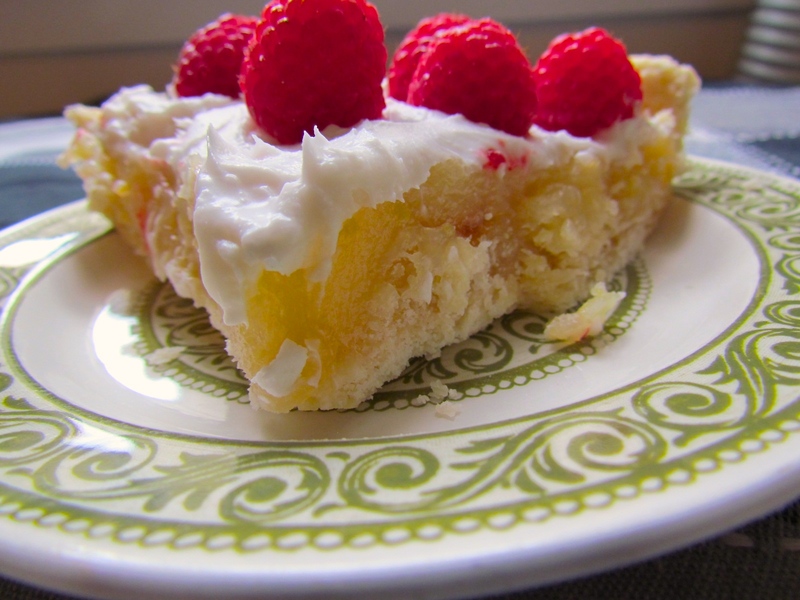 It’s zesty and tart, it’s sweet and creamy, the pastry is flaky and salty. All of the flavours you can want in one bite. I combined a few different recipes together to create it. 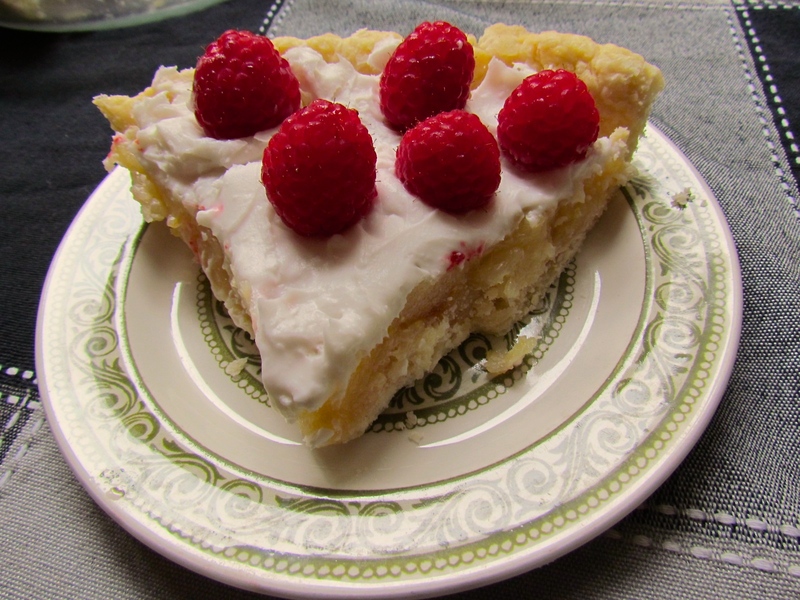 I used the filling recipe from the lemon bars, coconut whipped cream is a no brainer of course and I used my mother’s pie crust recipe. 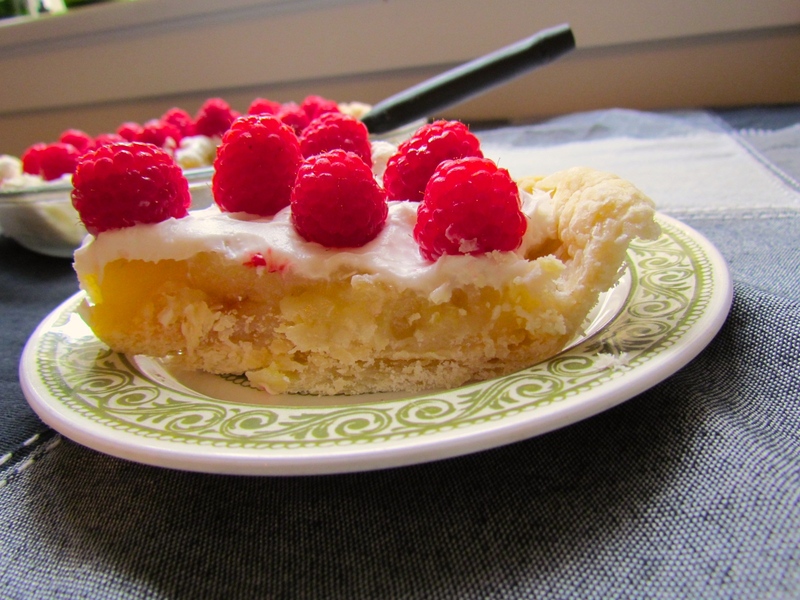 This is a decadent, I have all afternoon to bake a pie, kind of dessert. And it has to chill for eight hours to overnight before you can serve it. This isn’t slap dash, throw it together last minute, then rush out the door kind of dessert. You’ve gotta make pie crust. I love, love, love making pie crust. I don’t know why, there’s something almost magical about it. Sometimes, the planets don’t align, or your karma is off or something, and the pie crust just doesn’t work. Then you have to start all over again, pie takes patience. But when it does work, the chemistry and the magic, it’s a great feeling. You have to freeze the pie crust, then you have to bake the pie crust. You have to have time to make the lemon filling, which means you need the time to stand at the stove and whisk, whisk, whisk until your wrist hurts, until the ingredients meld together and becomes thick like pudding. Then after all that you pour the filling in the pastry and let it cool off. Once it’s cool enough you toss it into the fridge for eight hours. You can make your coconut whipped cream and chill it in the fridge in a sealed container, or you can make it when the pie is finished setting. Tip for the coconut whipped cream, chill the bowl and the beater in the freezer for about ten minutes prior to whipping it. Yesterday was beautiful and sunny and perfect weather for this kind of pie but today it’s all cloudy and grey. So I’m going to have an extra slice of pie, bring the sunshine with me. In a small bowl whisk together half the soy milk, cornstarch and flour until all the lumps are gone and it’s smooth. In a medium sauce pan combine the remaining soy milk, sugar, lemon juice and lemon zest. Bring the combination to a boil and then lower it to a simmer and slowly stir in the soy milk mixture. Whisk steadily for five minutes or until it has become thick and pudding like. Once it has cooled put it in the fridge for eight hours to overnight. Beat the powdered sugar and coconut cream together until it is light and fluffy. 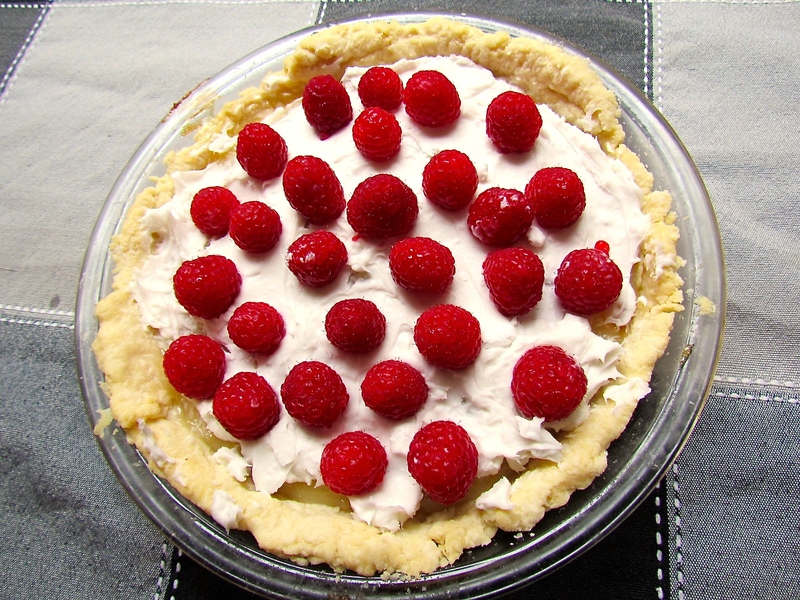 Spread over the cooled pie and decorate with raspberries.